While I saw this in our Fresh New Spaces Group, I had already seen it in sfgirlbybay earlier this week. Victoria has painted her room “Gravel Gray” by Benjamin Moore (BTW, she says it’s not quite as dark or as blue as it is appearing in her photographs). She’s also sleeping on DwellStudio’s Chinoiserie bedding. Finally, she’s looking for some input on which artwork to buy for this room. Check it out and chime in on her post! What’s hot? DwellStudio’s Peacock Citrine Duvet is! The July 2010 issue of Elle Decor listed this item as one of its five HOT picks. We couldn’t agree more. 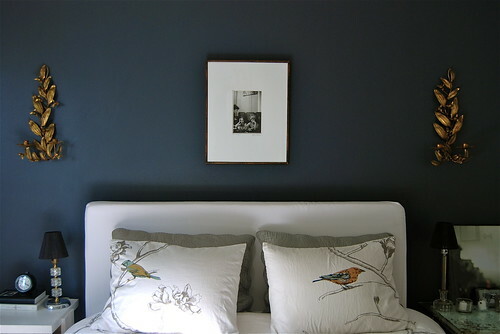 DwellStudio’s Peacock Citrine Duvet was featured as a high-quality bedding option for the Ola, Portugal! trend alert in the May 2010 issue of Connecticut Cottages & Gardens (Living in Style issue). Yesterday I had the pleasure of attending a talk by the founder of DwellStudio, Christiane Lemieux, at SCAD Atlanta. We’ve been carrying DwellStudio since it was plain old Dwell, and I smiled when she put up slides of her sketches from her first collection (“I couldn’t afford a light table, so I used the window”), as they were so familiar and are still some of my favorite designs. In just a few short years, Christiane has taken a textile company and grown it into a lifestyle brand, and she is starting to become a household name among the design set, just like Jenna Lyons. Next stop Oprah? Christiane geared her talk to the students, and laid out a path to entrepreneurship based upon her experiences. These included an education at Parsons, grabbing every internship under the sun (hers included a stint at Isaac Mizrahi), immersing yourself in the industry (manufacturing, shipping, selling, P.R., etc. ), finding a niche and exploiting the heck out of new media. Listening to these talks made me realize just how much the landscape of retail has changed for designers in the last decade. Portfolios on websites, Etsy stores, Social Media, microbrands, research, etc. have opened up so many opportunities to those who may lack a stockpile of start up bucks. Christiane encouraged students to license designs over selling them, to remain open-minded (DwellStudio’s images are used in a series of children’s books, something she’d never thought of! ), to form strategic partnerships and to diversify. She knows of what she speaks. Whenever Christiane has guest blogged over here, I’m humbled to admit they are the best posts we’ve ever published, and her own blog is beautiful. She is also one of my favorite twitterers (tweeters? whatever!). Thank you for the inspiration Christiane! In glancing at the new DwellStudio Home 2010 Collection images I thought to myself, “Self, the folks at DwellStudio have such an amazing eye for putting various patterns and colors together…this is certainly something that doesn’t come easy to the rest of us. So, Self, why not create a quick and easy ‘Deconstructed DwellStudio Home Collection Guide’ to help DP peeps put together the looks they like?” And I did. This is super basic but should hopefully help create the “bedscape” of your dreams without having to go back and forth between Design Public product pages to figure out what is what. This is just a smidgen of imagery from DwellStudio. If you see any other images on our site for DwellStudio or any other designer that you’d like to me deconstruct leave a comment and a link to the image and I’ll see how I do!